A new study on news consumption via tablet computers suggests catching up on the news is one of the most popular activities on the devices, rating even higher than social networking and gaming. But the research, conducted by the Pew Research Center’s Project for Excellence in Journalism with The Economist Group, found that most users still aren’t willing to pay for news on tablets. A year and a half after the iPad’s introduction, the study overall said 11% of U.S. adults now own a tablet of some kind. The vast majority (77%) use them each day for an average of an hour and 35 minutes. Among them, more than half (53%) access news on their tablet every day, reading long articles and checking headlines. That’s about the same proportion that uses email each day (54%), more than those who use tablets for social networking (39%), gaming (30%), reading books (17%) and watching video (13%). In another positive sign for the industry, three in 10 tablet news users say they now spend more time getting the news than before they had a tablet. Only 4% spend less time, and about two-thirds spend the same amount of time. Tablet news users also say they now prefer their new devices over traditional PCs, print publications or television as a way both to get quick headlines and to read long-form pieces. Tablets are displacing computer use in particular -- eight in 20 users say they now get news on their tablet that they previously got on laptop or desktop computers. Benefiting most from the emerging tablet news audience have been established brands such as CNN, USA Today and The New York Times. That’s largely because most people rely mainly on just one to three news sources on their tablets and look primarily to recognized names. Among those with news apps, 84% said the news organization was a major factor in deciding what to download. News readers for tablets like Flipboard, Zite and Pulse have lately attracted much buzz and venture capital, but so far have not gained much traction with tablet users, according to the Pew report. They accounted for only 9% of new sources named by survey participants. When checking headlines, 90% of app users went directly to a specific news source, compared to 36% turning to a news aggregator like Pulse. Despite publishers’ emphasis on developing tablet apps, the study found the mobile Web is still the No. 1 option for accessing news content. Some 40% get their news mainly through a Web browser, while 31% use news apps and the browser equally, and 21% get their news primarily through apps. That said, those who mainly rely on apps are also the most avid news consumers. Among these so-called power users, 43% say they spend more time getting news than before -- twice the rate of those who mainly go through a browser (19%). And eight in 10 (81%) get news daily, compared to 63% via a browser. These are the types of users publishers want to build on, because only 14% of tablet news consumers overall have paid for news on the tablet. Among those who haven’t paid directly for content, only 21% said they would be willing to pay $5 a month, and 10% would pay $10 a month. The Daily, News Corp.’s iPad-only news app, which charges 99 cents a week or $39.99 a year, would meet that minimum price standard. Even so, the company has been tight-lipped about subscriptions to date. 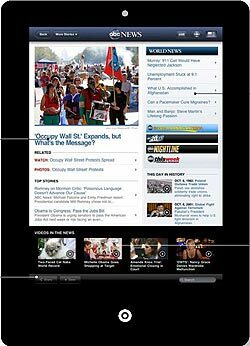 Others, such as The New York Times, bundle tablet app access as part of broader digital or print subscription plans. Who is paying for news on tablets? In addition to being the most voracious news consumers, they skew male (69%) and are more likely to be highly educated (68% have a college degree compared to 54% who haven’t paid.) They also tend to have deeper pockets -- 60% who have paid have household income of at least $100,000 versus 45% of tablet news users overall. People who have paid for news content are also more likely to describe themselves as liberal -- at 38%, compared to 29% who haven’t. Tablet users overall tend to be more educated and have higher incomes than the general public, but not necessarily younger. More than three-quarters of tablet owners (78%) are 30 and older. The survey findings were based on interviews conducted via land lines and cell phones from June 30 to July 31, 2011 with a total of 5,014 adults, including 504 who use a tablet computer.